Taking in the "spectacular views" from the Pinnacle in the rain! Yesterday marked yet another successful hike with TerraMar Adventures, despite Mother Nature's attempts to make the day a lot less fun. The weather was dismal when I rolled out of bed, the result of a giant rainstorm moving across Pennsylvania. I jumped in the car and drove to the Hamburg Reservoir parking area to meet the four other adventurers who'd agreed to brave the weather with us. Luckily, by the time we reached the reservoir, the rain had stopped. The weather forecast included additional showers and thunderstorms during the day, but we moved ahead with our plans anyway. After a small handful of wild raspberries, we took off. The Pinnacle/Pulpit route mostly follows the white-blazed Appalachian Trail, depending on which route you take. We followed the trail indicated in yellow on the map to the AT and branched off toward the Pulpit. The trail is quite wide all the way up, and we were able to walk side by side for most of the trip. Near the Pulpit, the trail gets rocky and can be slippery in the rain. 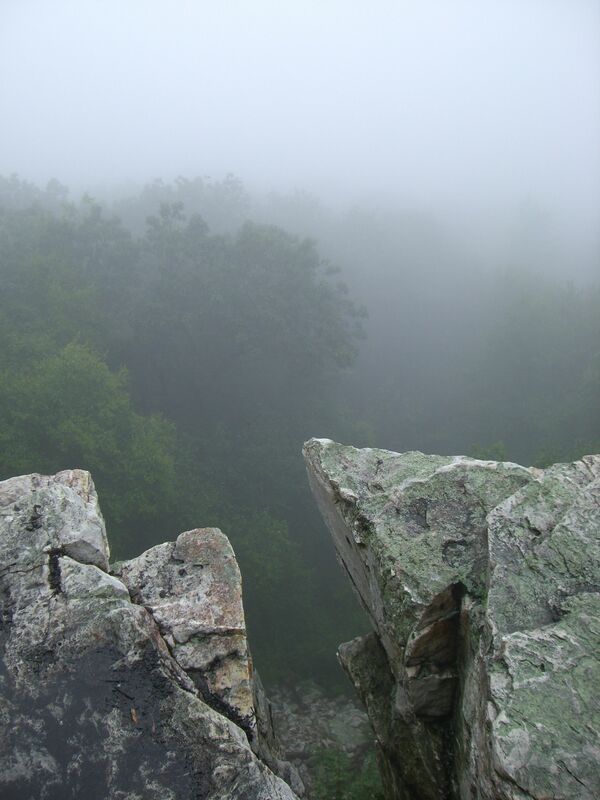 The view from the Pulpit is supposed to be breathtaking, but our view was more than obscured by the low-lying clouds. I'm hoping to get back sometime when the weather is better! Though hazy, the views were still great. We continued on to the Pinnacle, at which point the rain began to fall and we heard the distant rumble of thunder. We immediately started back down the trail along the AT toward the helipad area on the map. This route kept us further in the woods and out of exposed areas along the ridge. We reached the helipad and branched off to the left, heading south toward the Hamburg Reservoir. By the time we reached the reservoir, we were shedding rain gear and layers as the sun peeked through the clouds as the thunder stopped. The end of the day turned out perfectly, and after nearly nine miles of trail, we were ready for food. Our little caravan made it to CJ Hummel's restaurant in Lenhartsville, where I had one of the best restaurant-made grilled cheese sandwiches I've ever had! Try it Philly cheesesteak style - cheddar, onions, mushrooms and sweet peppers - on whole wheat bread. The day was great overall. 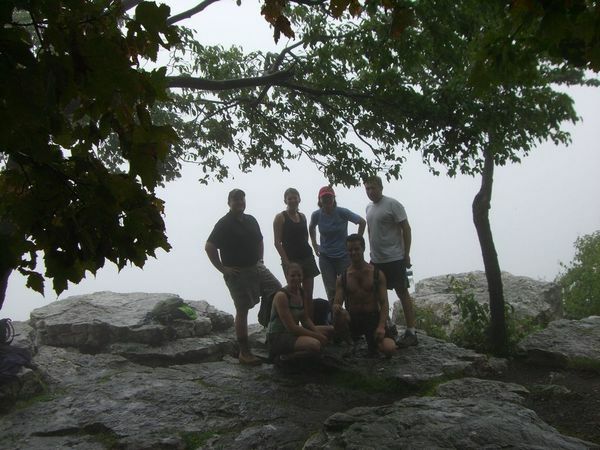 Leading group hikes with people you've never met can be tricky, especially when the weather turns sour. But our group was fantastic, very positive and upbeat the entire day. Of course, things could have taken a terrible turn had the thunderstorm been closer to us. We should have considered changing our plans, but being as excited as we were about the day on the trail, we did not. I'm sure many of us have found ourselves in a thunderstorm while engaging in outdoor pursuits, and I wanted to share a little information with you about how to manage thunderstorm risk. Information here and here from the Red Cross. Plan your hike around the weather. If you know a storm is coming, keep in mind they typically develop mid-afternoon in the summer. If you're outdoors away from vehicles and other shelters, find a low area with short trees or shrubs. Avoid tall or isolated trees, utility poles and fences, and areas that are obvious draining or runoff areas. When you find a spot, crouch low to the ground on the balls of your feet. Do not lay down. Do not take shelter under overhanging rocks. They can be targets for lightening. If you're camping, make sure your tent is not the tallest object in the vicinity. Don't camp on a hill, under isolated trees, or near any metal objects. Have you ever been caught in a thunderstorm on the trail? What did you do?